Curvy Lynn Davidson has never had a real relationship. Working as a guide in the wilds of Glacier National Park doesn't bring on the men. And being a middle-aged, no-nonsense outdoorswoman in hiking boots and a utility vest is the nail in the dating coffin. Besides, Lynn knows what happens when people get close: they leave. It's better to stay independent and alone...even when temptation drops right into your lap. Right? Lion shifter and Marine vet Ken Turner has his eye on the prize: his job. As an environmental scientist, scoring an assignment to Glacier Park is a big deal. All Ken wants is to have space to roam, and work to protect the wilderness he loves. Romance is the last thing on his mind--until he sees Lynn, and everything else falls away. Neither Ken nor Lynn ever thought they'd find their mate, but together they're caught up in a storm of love, desire, and protectiveness. But can Lynn overcome her fear and accept that love doesn't always lead to heartbreak? And what happens when a hostile pack and a family crisis threaten their newfound home together? 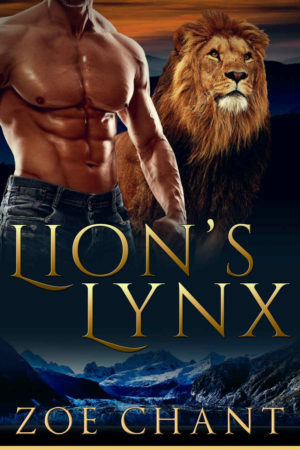 Lion's Lynx is a funny and heartwarming paranormal romance that features gorgeous vistas, loving families, a hot hero, and a touch of action. No cliffhangers!